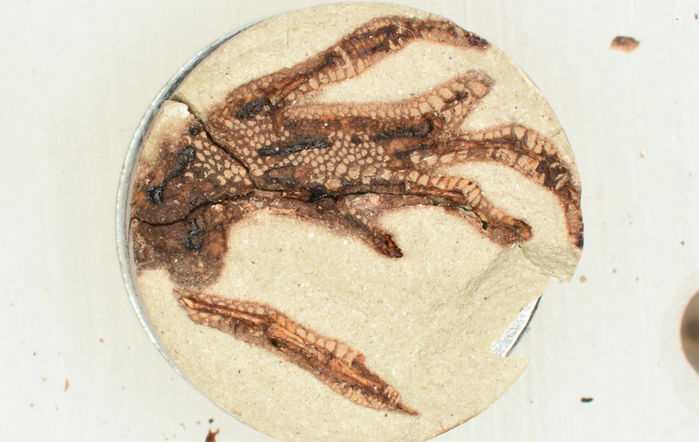 Humanmade “fossils,” like this soon-to-be-preserved foot from an Anolis lizard, can teach scientists how fossils form and soft tissues survive the ravages of time. When paleontologists want to know the texture of an ancient lizard’s skin or the color of a long-dead dinosaur, they have to get lucky. Few fossils contain traces of the soft tissues that would reveal those answers. But by “baking” their own fossils with pressure, heat, and clay, scientists have now found a way to reveal how soft tissues preserve in fossils that turn up millions of years later—an approach that may allow researchers to peer into the past like never before. To figure out how soft tissues preserve in fossils, scientists test how each component fossilizes—or doesn’t—in the lab. But this approach leaves out complex geochemical and biological interactions, and it still doesn’t help researchers understand what the entire organism looked like before it became a fossil. Recently, some investigators have tried to create their own fossils by wrapping bird feathers in sealed gold packets and exposing them to high pressure and heat. The technique—used by the oil and gas industry to study the chemistry of fossil fuel formation—preserved the feathers, but in a dark goo similar to crude oil. So Saitta and colleagues came up with a new method. 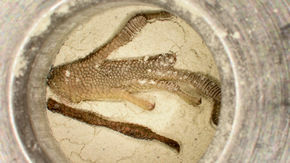 They encased their samples—chicken feathers, lizard feet, and lizard heads—in clay tablets inside a steel piston. Applying 3500 pounds of pressure with a hydraulic press to create a kind of sedimentary rock, they baked the 1.25-centimeter, pill-like clay tablets at a temperature of 250°C for 24 hours—enough pressure and heat to mimic a fossil buried 0.8 kilometers underground for tens of millions of years. When the tablets finished their baking, they looked so real—similar to exquisite specimens from Canada’s Burgess shale rock—that the team members argued over who would get to crack them open, just like they would in the field. Inside the artificial fossils were skeletal remains and a dark film outlining the feathers. The dark stains were made up of melanosomes, minute, organlike structures that hold melanin had gotten rearranged after going through the fossilization process. But muscle tissues, body fat, and keratin protein from the feathers didn’t survive the process. That means the ability to resist high pressures and temperatures—rather than the amount of decay—is what allows for the preservation of organic molecules in such fossils, the researchers report in Paleontology. Melanin pigment can remain intact for 200 million years. But this experiment is the first to show that it alone leaves behind the impressions of soft tissue like feathers, rather than a matrix of melanin trapped within preserved keratin protein, as previously thought. That means birds like white swans would be unlikely to leave a trace because melanin is needed to preserve skin and feathers. This fossil time machine could help paleontologists solve a host of mysteries, including how the chemical signatures of different pigments alter over time—allowing them to better reconstruct the original color of dinosaurs. They could also help test whether collagen, a type of protein that makes up connective tissues, can be preserved in fossil bones 3.4 million years and older. If it can, such ancient proteins could help researchers reconstruct the evolutionary relationships between ancient creatures. Next, the researchers plan to let their samples decay before turning them into fossils in their time-baking machine. They also plan to add water, to simulate moisture underground that can promote the escape of soft tissue, or cement pores shut during fossilization and prevent their escape.